Yesterday I was emphasizing to my workshop participants, the importance of leadership. You need to be a great leader, in your business as well as personal life. 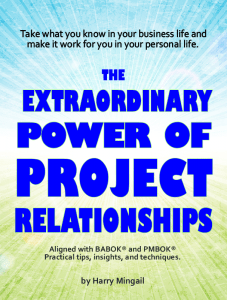 Here are the 12 factors (extracted from my new e-book The Extraordinary Power of Project Relationships), you can consider to assess your leadership or maybe also the leadership of someone else. 1. My subordinates come to me for advice and instruction. Rarely do I have to send for them on routine matters. 2. My suggestions to subordinates are heeded. They are not misconstrued as orders. 3. I can go anywhere within the organization without experiencing embarrassment or constraint. 4. I am the first to hear about a new organizational problem. 5. My subordinates are comfortable making decisions on their own. 6. If I have been away, I do not return to a crisis situation. 7. My subordinates have differences over organizational policies. However, these do not lead to personal quarrels. 8. Rank and file members of my organization seem pleased to meet with me when we unexpectedly see each other. 9. When presiding at meetings of subordinates discussion of issues comes easily. 10. When I attend a meeting run by one of my subordinates, it proceeds smoothly. 11. My group has low turnover and absenteeism. When a position under me becomes available, there is considerable competition to fill it. 12. I do not have to deal with a rebellious coalition and do not partake of a coalition myself. Great, loved and respected leaders also take the “high road” on high morale ground. They are not manipulative, coercive, rude, and disrespectful. They lead family, frienda and business teams to do the right things and make sound decisions based on the facts … for the good of group not for themselves. Reward yourself in you career and in the relationships in your personal life, by harvesting the happiness, success and legacy of which you can be proud. Uncover, nurture and apply great leadership.